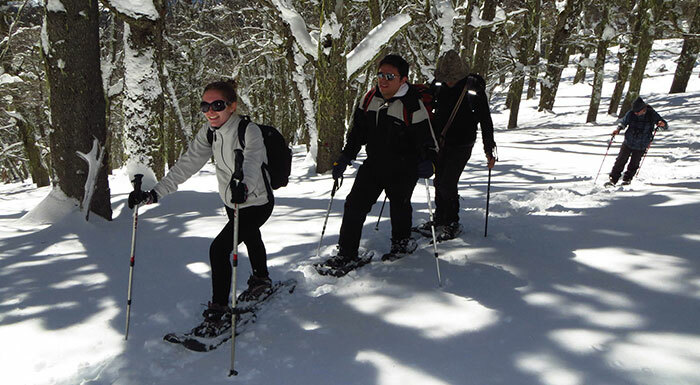 Snowshoeing in Bariloche. 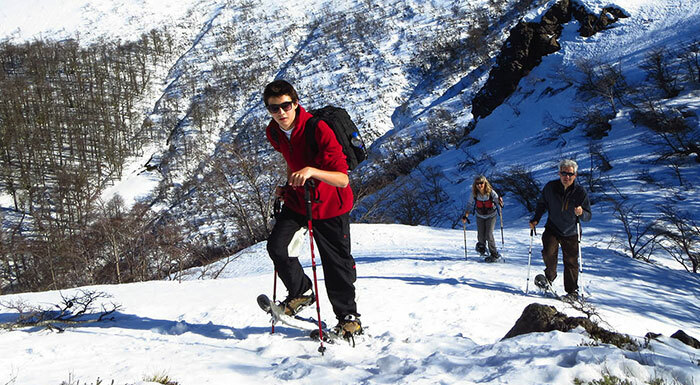 This Winter, come and enjoy a real mountain experience. 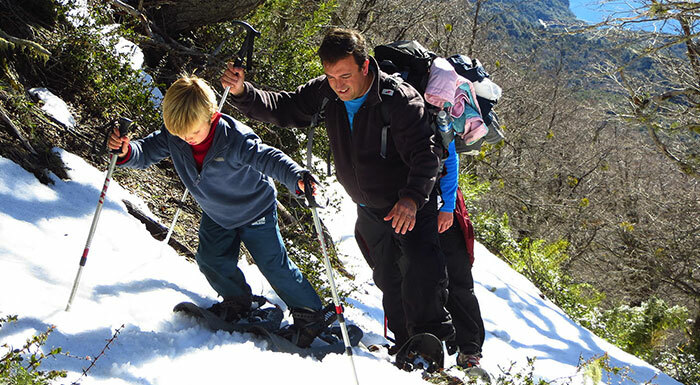 Live the adventure of snow-shoeing across the mountains while feeling the peacefulness and quietness of the Andes and its majestic scenery. The day trip begins at the foothills of the mountain, here a 4×4 truck will be waiting for you to drive up a mountain road towards the Mountain Hut. There, your Mountain Guide will gear you up and fill you in on some details regarding snow-shoeing and risk management information. You will carry a home-made box-lunch with amazing sandwiches, granola bars and a chocolate brownie. The itinerary follows the a ridge climbing through an old growth “Lenga” forest. Keep your eyes open for some Magellanic Woodpeckers and Austral Parakeets or other local birds. Quickly you gain elevation and reach the first view point. Enjoy a short break, take in the view and enjoy a hot tea while learning about the National Park landscape. The climb continuous, the ridge gets thinner and more dramatic thought the woods. After two and a half hours of hiking you reach a rocky outcrop that rises over the trees. This point offers a 360° view where you will pause for lunch and relax. 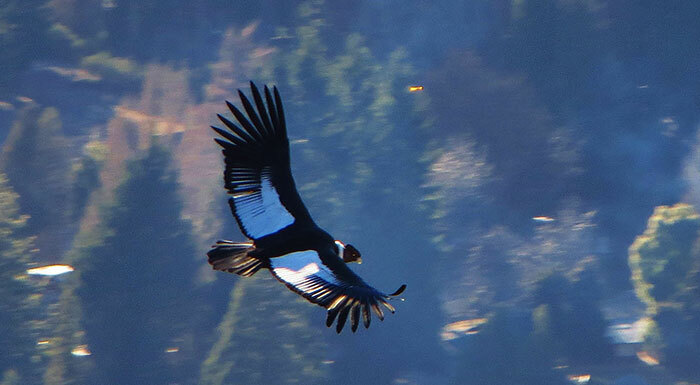 It is common to watch Andean Condors flying across the mountain at this altitude; you are now at 5300 feet of elevation. 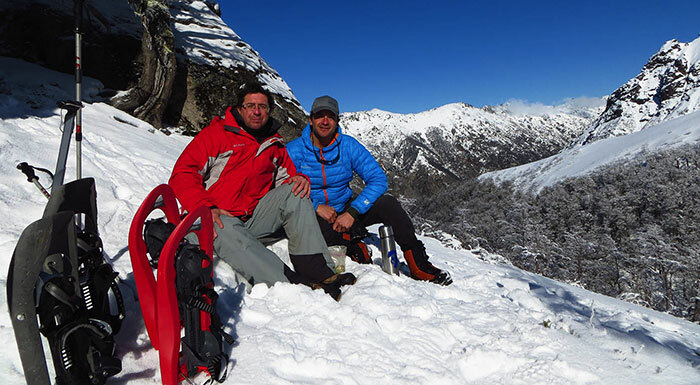 The guides will melt some snow to provide you with a hot soup and a setting pad for relaxing on the snow. Time to restore your energy with two delicious home-made sandwiches and brownie. If the energy is still up, you can continue climbing towards a higher shoulder following the ridge where you can access new views and the alpine terrain. The descend follows the ascent route and in one hours you find yourself again at the cozy mountains hut enjoying the beautiful view with a cup of hot-cocoa on your hands! Certified Mountain Guides English-Spanish-Portigues speaking service.